I’m sure you’ve seen it, heck, maybe even my click bait title got you here, but here’s the thing: There is no one-size-fits-all when it comes to blogging. According to the “experts”, I’m a failure. I’ve yet to make a dime off of this corner of the internet, so if that’s why you’re here you can click off this page. 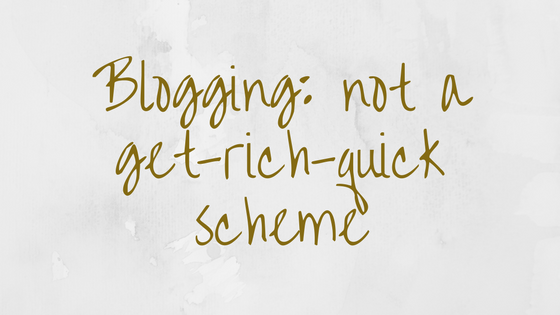 Let’s be real, everyone wants to their blog to be successful. Most people would love to quit their job to work from home and make ridiculous amounts of money by blogging, here’s the thing: that’s not the reality. If you get on Pinterest and look for “blogging tips” or really just anything to do with blogging, it’s all about trying to make $20,000 in the first month. Quite frankly unless you already have a huge online following, like Poppy Dayes, it’s not going to be your reality, well, unless you get super lucky. So here’s my question: why do so many of those posts exist? How are there blogs dedicated to making money via blogging? Personally, I believe that it’s because there are a handful of people in the “public” eye making buckets of money via social media, blogging, YouTube, etc. That’s not why people started doing those things though, they did them because they liked it. They fell into the money and now people see it as a get-rich-quick scheme. It drives me crazy the number of posts I see on how to make $8,000 your first month blogging, or $20,000 your first three, or even “How I quit my six-figure salary full-time job to become a stay at home mom and blogger.” That’s not how it works for everyone. You need your blog to be filled with passion, good content, and it to be what you want it to be. If you formulate your whole blog around someone else’s definition of what a successful blog is, how does that make it any different from the 9-5 job you hate? You still aren’t doing what you love. There isn’t a one-size fits all blogging method. Plain and simple. If it worked like that we would all be rich. While your content, SEO optimization, keywords, pictures, and outlook is all extremely important to blogging and striving to make money from it, there is an element of luck. The right people need to see your blog and think it’s good enough to be successful. At the end of the day, make it something you love and you’re proud of. Don’t worry if it translates into money or not, don’t count on it is my advice. If it happens, think of it as a happy surprise. If you’re going into it looking to be rich, I just don’t know how successful you will be. I would be lying if I said that blogging full time isn’t my dream career because it is. There are a few things in life I’m passionate about and blogging is the biggest one. I’ve been doing this for almost four years and I’ve made microscopic amounts of money from it, but it doesn’t matter. I love every second that I’ve poured into my corner of the internet. I treasure every person that I can call a friend because I decided to write a blog. I have a job with benefits because this blog is what made me passionate about the internet. Take those things into account if your blog isn’t literally paying off because psychologically it probably is. There’s no way I would be where I am today without this site. Blog because you love it. Blog because it will change your life. Blog because you want to. Don’t blog to make six-figures a year. I am in your niche. I felt the same way. Then, a successful blogger told me people would find me and offer me financial opportunities. I grew my Twitter following 2/12,000, and now they do write me and offer me financial opportunities. Other people write that they have found me on google. You and I are like-minded bloggers. I blog about blogging also. I blog over at http://mostblogging.com. Maybe you can check out my blogging tips site. I explain all these tips in my articles. I also host six blog parties a month or you could meet new readers. I don’t deny that there is an element of luck. However, I feel you need to follow certain strategies for that luck to find you. My articles will give you those strategies. These kind of videos and posts that you’re talking about remind me of those little leaflets that used to get put through the door saying “Earn £100 a day, no sales required”. As soon as someone says no sales required, you know full well that it’s going to be a sales job! It’s just that it’s moved online now. Ugh. I feel like I’ve been trying to make my blog into something I love for so long, but I always run out of ideas, or feel like something is off and I can’t quite figure out what. Blogging has definitely helped me get more comfortable with people reading my blogs (I don’t edit my posts), but I want it to be better. I feel like my blog-writing is rather lackluster but my academic-writing is stellar and I can’t find the casual blogging voice that I’m looking for. But as I read your post, I think I maybe need to reframe how I’m thinking about my blog. I don’t know. DOes that make sense? Totally makes sense and I 100% agree. If you want (and you’re comfortable) we should Skype sometime and work on our blogs together to bounce ideas off of one another! I agree 100%. It’s not about the money but about doing what you love and enjoying it. And having an impact on even one person’s life is worth it all in my opinion. I blog like a journal. I just switch back and forth at times or go months without writing at all if I’m to busy . Basically my writing has been about my life, things I’ve used or places I’ve experienced, things I’ve created, etc. I want it to be more than that, definitely more organized and planned but like you said it’s not about the money, I’ve never made anything or even tried to. I write because I loveto get my thoughts out and I post them online because maybe one day hopefully one of my experiences will inspire someone else. Thanks for this post! Yes yes yes. I think that’s exactly what blogging should be. Thank you for your lovely comment!